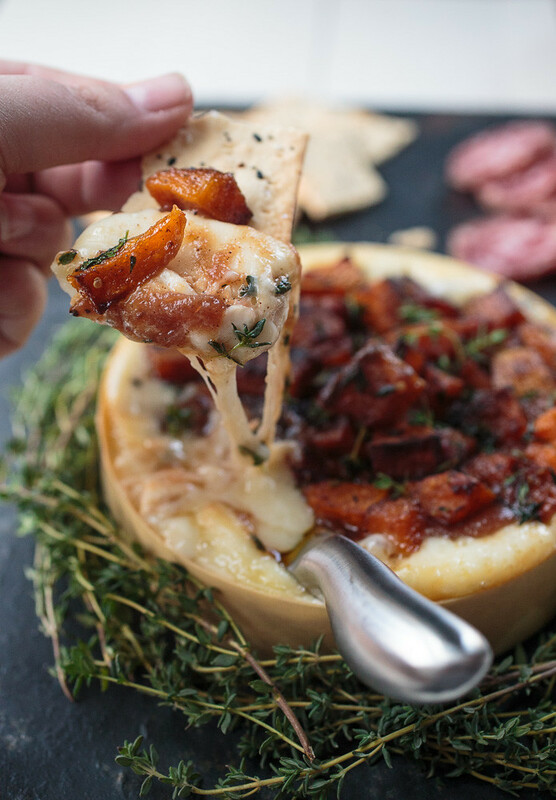 Baked Brie with Apple Butter, Butternut, and Thyme: a stunning, simple, and insanely delicious holiday appetizer that will WOW your crowd! There’s one thing that stumped me for years about Kyle and it about killed me when he first let the cat out of the bag. He told me forever ago, probably on around a holiday appetizer table or maybe at a wedding, that he didn’t like brie. Dead, right? How does one NOT LIKE BRIE? It wasn’t long before, after my incessant pestering questions and continuous offers at every event that involved brie, that I figured out he doesn’t like the rind on brie. Ah ha! Well that makes sense since nobody really loves the brie rind, right? I myself nearly gave my French family all heart attacks when they served a gorgeous pie-shaped piece of brie after dinner one night and I scooped out the cheese from between the rind. The good thing is, I’ve solved Kyle’s brie issue with this baked brie with apple butter, butternut, and thyme. That’s right. I fancied-up a wheel of brie for a work party a few weeks ago for the sake of making a gluten-free and low carb snack for my co-workers food preferences. I sliced off the top rind of the brie wheel, loaded the brie up with maple roasted butternut squash that I quickly sauteed in some brown butter and fresh thyme, and baked it until the cheese was melted and dip-able. And let me tell you, it was a huge freaking hit at that party. This past weekend, I remade the baked brie, adding a layer of apple butter on the brie first before piling on the squash. 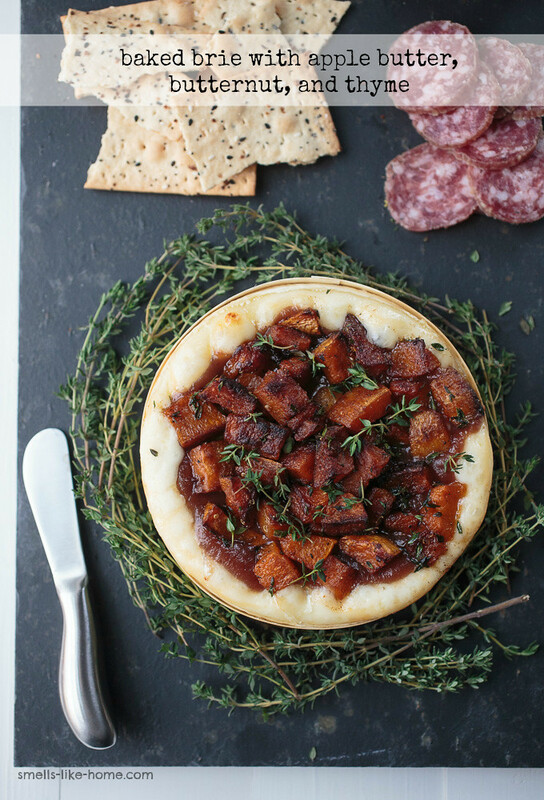 Because apple butter, baked brie, butternut squash, brown butter, and thyme? Only the best thing to hit my lips in weeks. This stuff is ahhhmazing! The two of us unabashedly tore through nearly 16oz of brie and the toppings in an afternoon so if you’re thinking about making it for a Thanksgiving crowd – please invite me over! – you may want to consider doubling this recipe. 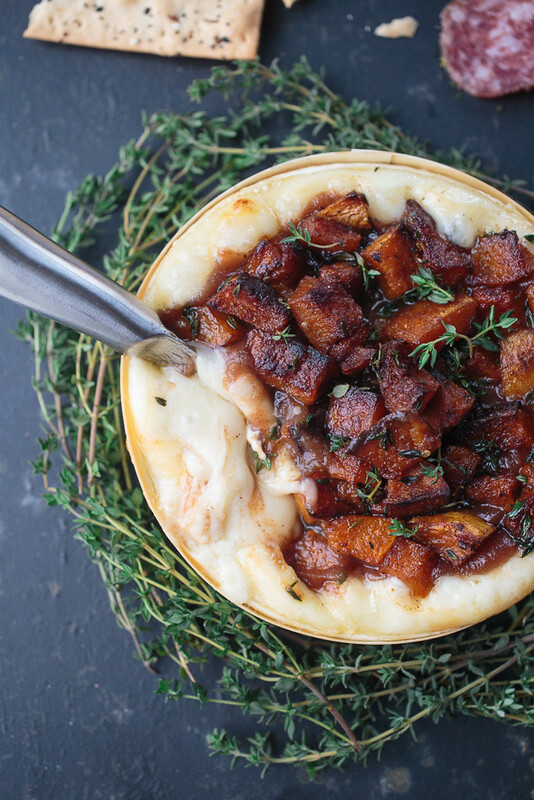 This baked brie with apple butter, butternut, and thyme will be gone before you can run to the kitchen for another stiff drink that might be helping you through the holiday (just sayin’). Promise. Preheat oven to 350° F. Unwrap the brie and lay the cheese on a flat surface. Discard the wrapper but set the bottom part of the container aside. Using a serrated knife, slice the brie rind off the top of the brie, taking care not to cut off too much of the cheese with the rind. Place brie wheel back into the bottom part of the container and set the container on a piece of parchment, then set everything on a baking sheet or in a glass or aluminum (disposable) pie plate. At this point, you can let the brie sit at room temperature for up to 30 minutes before baking – this will reduce the baking time so plan accordingly. In a medium skillet, melt the butter over medium-high heat, swirling occasionally until brown bits start to form on the bottom of the pan. Once the butter turns very slightly golden brown, add the squash and thyme (be careful – the thyme may spit at you in the pan). Toss to coat and lightly saute for just a minute or two. Spread the apple butter over the brie, top with the squash, thyme, and brown butter. Bake for about 15-20 minutes, or until the brie is melted and the squash has started to sink into the brie. Slide the brie (still in the bottom container) using the parchment paper to a serving platter. Serve immediately with crackers, toasted bread, sliced salami, or sliced soprassata (or all of the above). Wrap any leftover cheese (hah!) tightly in plastic wrap and refrigerate. Such a delicious brie!! This looks lovely! It certainly was! I hope you love it!! WHAAAAAT?! I need this. NOW. Whoa Nellie! I can understand not liking Brie could possible be a deal breaker. That’s my favorite cheese. You really did an innovative number on it—-along with Pink Parsley. This would definitely be the hit of any party.